Enjoy the top 1 famous quotes, sayings and quotations by Alan Ross. Heroes in fact die with one's youth. They are pinned like butterflies to the setting board of early memories-the time when skies were always blue, the sun shone and the air was filled with the sounds and scents of grass being cut. I find myself still as desperate to read the Sussex score in the stop-press as ever I was; but I no longer worship heroes, beings for whom the ordinary scales of human values are inadequate. One learns that as one grows up, so do the gods grow down. It is in many ways a pity: for one had thought that heroes had no problems of their own. Now one knows different! Want to see more pictures of Alan Ross quotes? 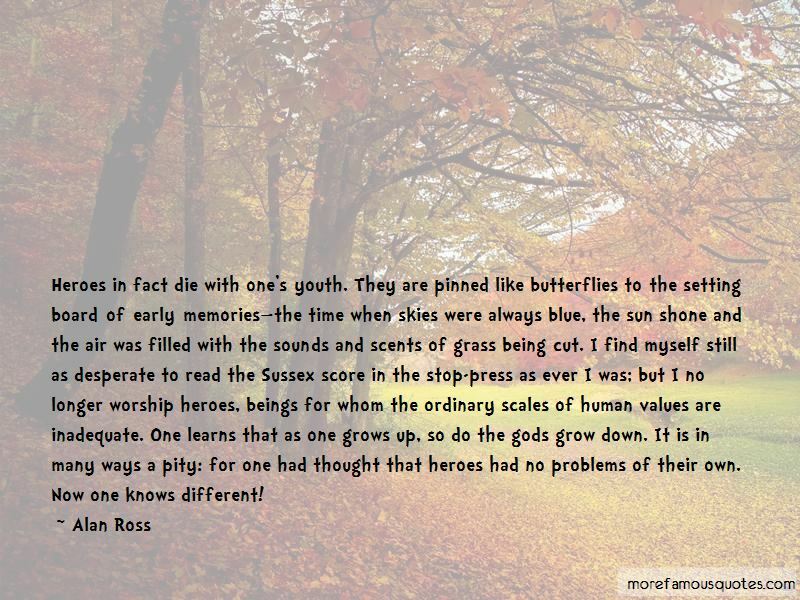 Click on image of Alan Ross quotes to view full size.